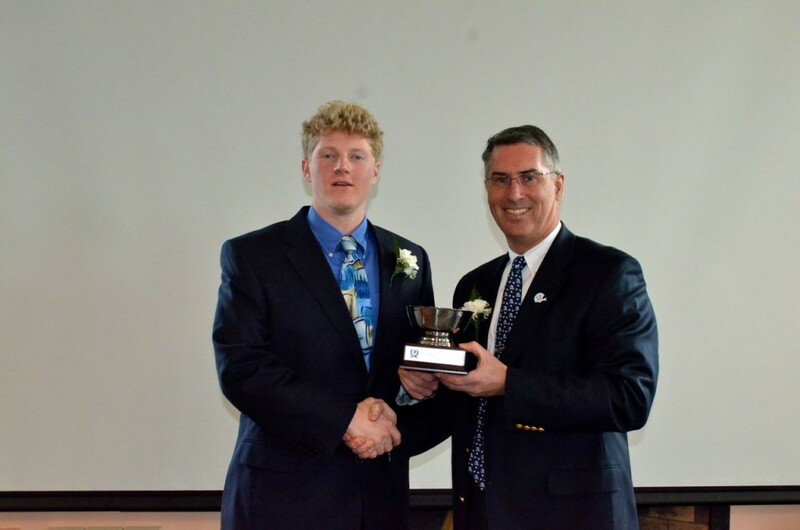 Editor’s note: On April 7, Williston Northampton’s Director of Athletics Mark Conroy presented the Frank Boyden Award to John Woodside ’13 during the National Football Foundation banquet. The following are Mr. Conroy’s remarks for the event, which was held at the University of Massachusetts at Amherst. Also receiving recognition were All New England honorees Dylan Arthurs ’13 and Ledell Robinson ’14. The Dr. Frank L. Boyden Award is given in honor of the longtime Deerfield Academy headmaster. The award is given in recognition of outstanding achievement both on the football field and in the classroom by a prep school football player. This year’s Dr. Frank L. Boyden recipient is a senior at Williston Northampton School. A native of Amherst, Massachusetts, he has enjoyed a terrific career both on the field and in the classroom. As a football player, he captained this year’s Williston squad as a two-way end. Offensively, he was an outstanding blocker at the point of attack, helping the Wildcats average nearly 7 yards per carry this past season. Defensively, he started at strong side defensive end where he was a team leader in tackles and a league leader in sacks. In recognition of his excellent play, he was named to the All Colonial League team for the second straight season. Speaking as his coach, he is everything you would want in a football player – intelligent, tough as nails, unselfish, and extremely dependable. Beyond his playing exploits on the gridiron, he has also been a standout at Williston both as a student and as a citizen. Taking a very challenging academic course load he has consistently earned High Honors with over a 92 average. In the last three years, he has had only two final grades below 90! This fall his course load included five AP and Honors classes. True to form he received straight As! In addition to his accomplishments above, he has made his mark in many, many other ways at Williston serving in numerous leadership roles throughout his years. Next fall, he will be attending Colby College in Maine where he hopes to continue his success both on and off the football field It is with great pleasure that I award the 2013 Dr. Frank L. Boyden Award to John Woodside. Senior Kevin Conroy is this year’s recipient of the Dr. Frank L. Boyden Award, an honor presented by the Western Massachusetts chapter of the National Football Foundation and College Hall of Fame.